In 1912 a Royal Naval Air Station was established on land acquired from 3 farms, including Upper Vaunces farm, on the south of Pulham St Mary. Small non-rigid airships flew from here to engage in patrols over the North Sea. These early airships were given the name ‘Pulham Pigs’ after a local man, on seeing an aircraft overhead, remarked ‘Thet luk loike a gret ol’ pig’. Pulham’s first rigid airship arrived in April 1917 and was employed in experimental work. The first permanent airship mooring mast was built at Pulham and its base can still be seen on the site today. It was 120ft high with a ladder on the outside to give access to the ship. In the 1920’s the station became a base for the R33, which was blown across the North Sea after being torn from her mooring by a gale. Another notable airship based here was the R34 which made the first east-west air crossing of the Atlantic in 1919. There is a plaque in the village centre commemorating the flight. 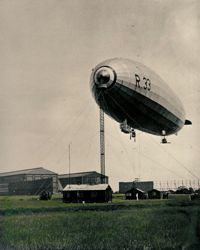 Pulham was one of the main UK airship stations, with more than 3,000 men on the base, until the demise of the R101 in 1930 when the station was moved on to a care and maintenance basis only. Pulham Air Station was also the location for pioneering investigations into parachuting, as by 1917 it was the headquarters of the Parachute Experimental Staff. During and after the Second World War the base was used as a storage depot for crashed aircraft from throughout Eastern England. The site was also the munitions store for the East of England and the RAF had a test firing range here. RNAS Pulham was the chief research establishment for airships until a move to Cardington in Bedfordshire. It was also the storage site for many British airships and Zeppelins. Pulham was instrumental in setting up air traffic control in the UK, using Marconi radio beacon equipment. One beacon was at Pulham, and one at Croydon. This was the first attempt to help pinpoint the location of planes. Pulham Air Station (or RAF No 53 Maintenance Unit as it was by then known) closed in 1958, and the land was sold at auction in 1962.